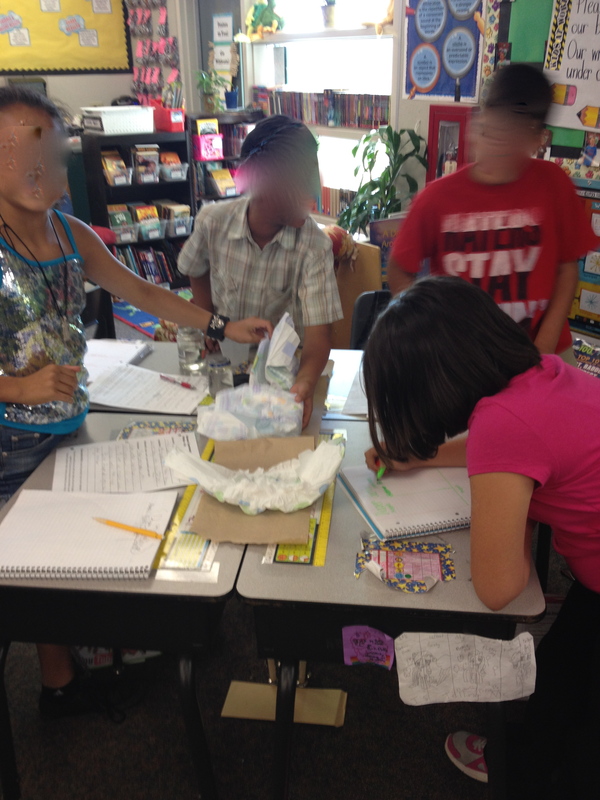 This year I made a firm decision that no matter what happens, I would include science experiments in my instruction. It is my belief that we are not truly teaching science, if we are not conducting science experiments in our classrooms. How else will the students begin to genuinely think like a scientist and understand the scientific method without actually experimenting in class? The answer is simple. They won’t. Great product! Has all materials for experiment and more. This particular product has more than just the science experiment in it, but I just used the PPT to explain the key points I wanted students to focus on i.e. how to record observations. The question to be investigated was: Do Skittles dissolve faster in hot water or cold water? The following are pictures of the students conducting their experiments. I chose to leave the procedure part open to each group to decide the steps they needed to take. I simply told them the materials and tools that would be available to them (pretty much like the diaper experiment). And might I add, the procedural steps were SO MUCH BETTER than the first experiment. Yay, they are learning from their mistakes! Just look at how engaged these kids are. I love it! Love seeing the students all leaning in like this! Totally engaged. Look at this engagement!! Love it! 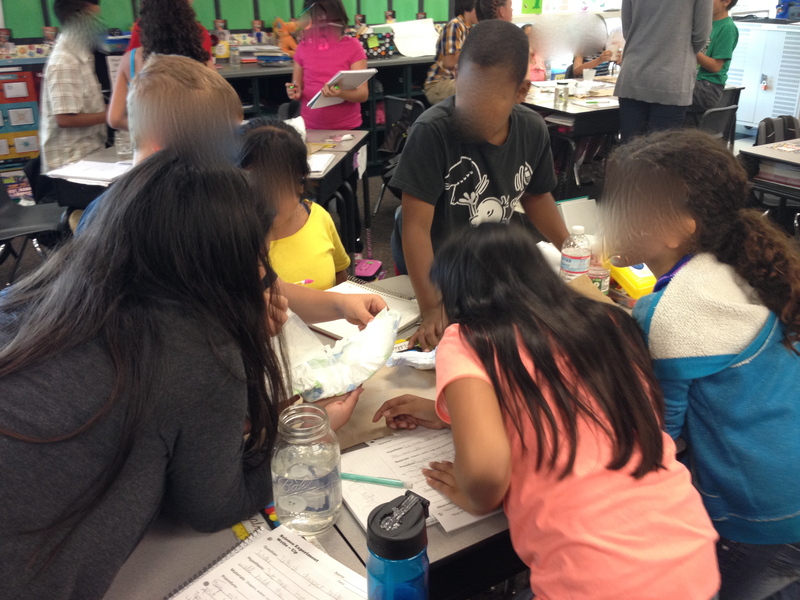 Students working together, each with a different responsibility for this science experiment. Teaching the students how to label and to be precise and accurate with tools. 1. I heated water from home and brought it to school in a large thermos. I also have a Keurig in the classroom and was prepared to use that if we needed more water. 3. Set aside at least an hour of time for this lesson. On average, skittles were dissolving in 8-10 minutes and the experiment calls for 3 trials. Personally, I thought this was a good lesson on patience and persistence. They are used to conducting school experiments in which the “reaction”, whatever that may be, happens pretty quickly. The students struggled tremendously with having to wait and watch the changes in the skittle because it occurs slowly. I used this as a teaching moment to explain how meticulous and patient real scientists need to be in order to obtain reliable data. Scientists do not dismiss experiments simply because “something” doesn’t happen after a minute. Reliable data is usually gathered over long periods of time. Overall, the students had a great time being scientists. Once we finish recording all the data on their lab sheets, I’ll post some pictures of the final product. They can’t help, but love a science experiment. 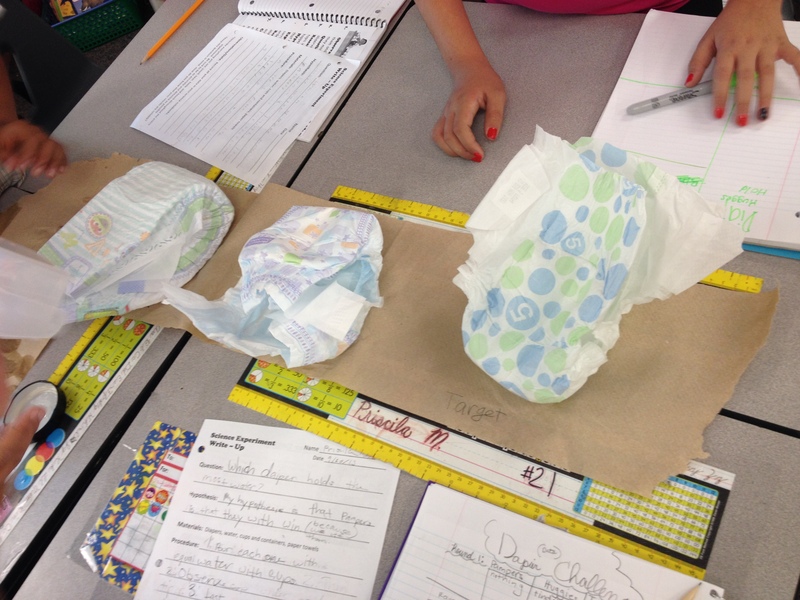 Which diaper absorbs the most liquid? My way of introducing the scientific method.. 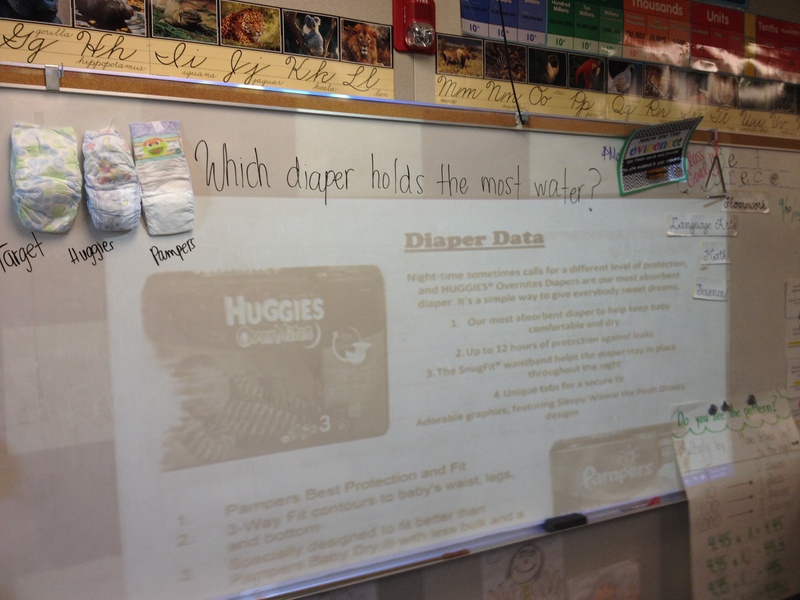 Which diaper absorbs the most liquid? Too often, we teachers, try to bring science experiments into the classroom (with not help from schools or our curriculum) that are frankly just too difficult. Whether we don’t have the materials necessary or even the knowledge of why this chemical reacted a certain way, etc. These obstacles have always made bringing true experimentation into the classroom pretty much non-existent. I hate this. So, then my diaper problem seemed like something my kids could handle. 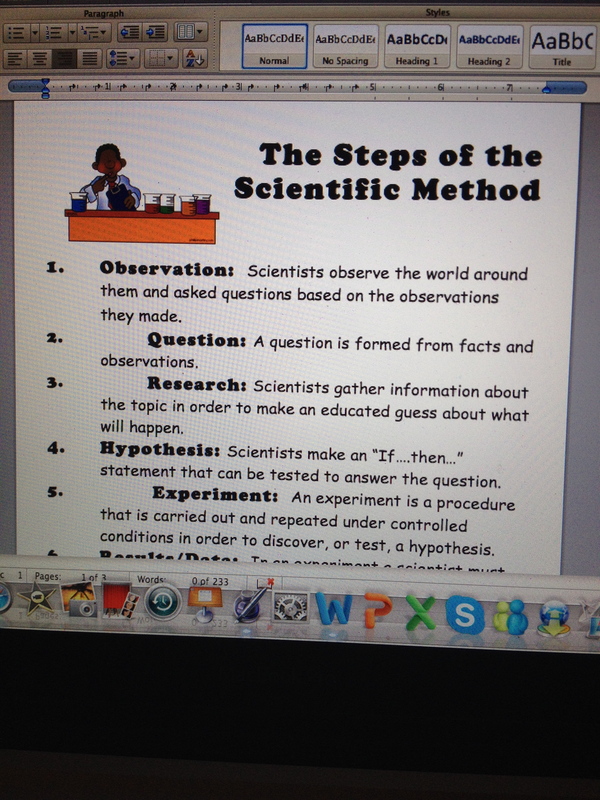 The first thing I did was show the kids a video (found on youtube.com) about the scientific method. It’s pretty cheesy, but it did it’s job of getting the kids excited and in a great mood. 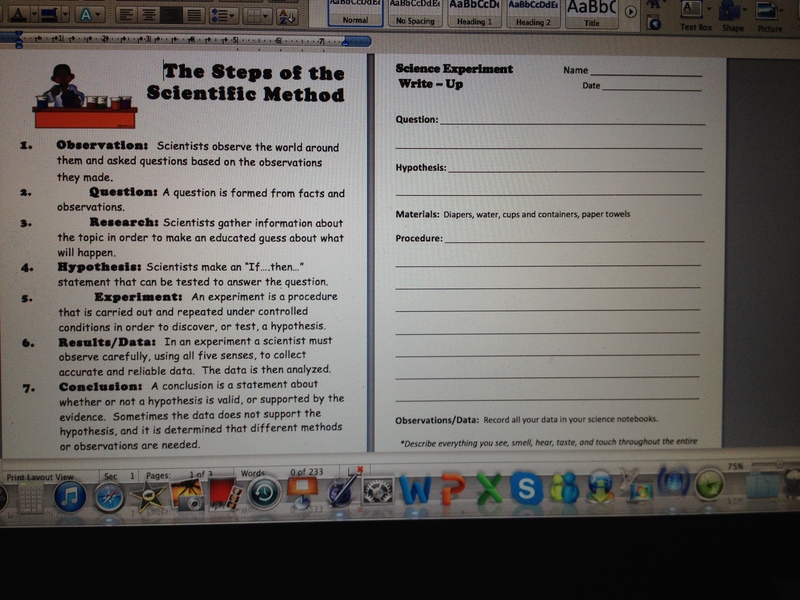 I then passed out the scientific-method.docx (as seen below): steps of the scientific method to be glued in their notebooks, a lab write-up sheet for the experiment, and diaper data. 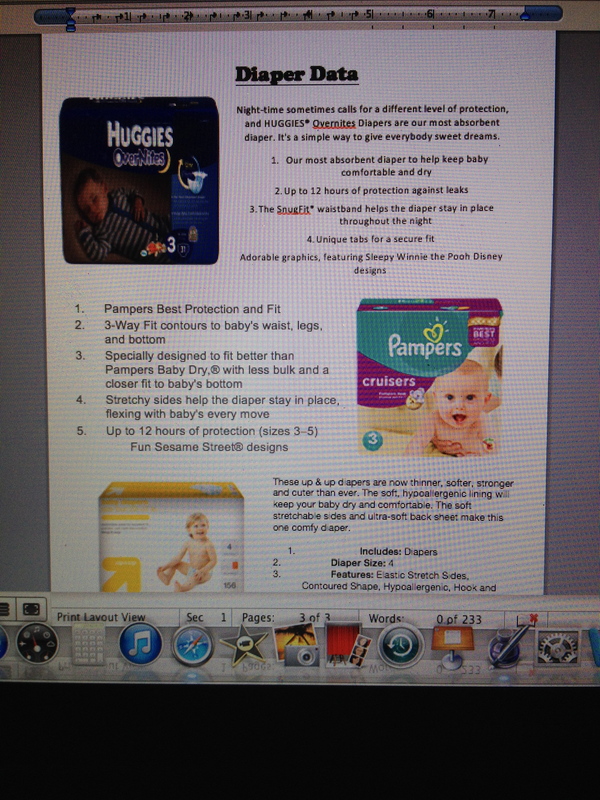 The last one is a sheet listing the three diapers to be tested with some basic information which was taken straight from each brand’s website. After students looked over all the data and discussed at their table groups any prior knowledge they might have, each group had to agree on a “team” hypothesis. After each team has a hypothesis, THEY design their experiment and record all the necessary steps on the form. I simply tell them the materials they will have at their disposal and they plan the rest. Of course, I walk the room and monitor their discussion, but I do feel the best results occur if they are left alone on this first attempt. They learn SO much from their mistakes. For example, only 4 out of my 6 teams felt it was necessary to EQUALLY MEASURE the amount of water to be added to each diaper. 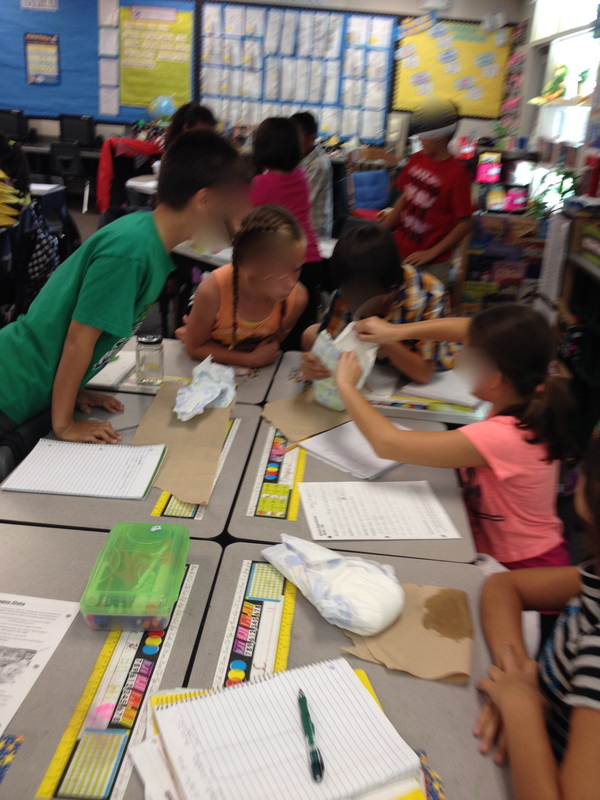 The next day the students conduct their experiments and record their observations in their notebooks. It’s pretty awesome how into it they all are. The experiment probably took about 30 minutes to complete and results were then discussed as a class. One team was actually pretty organized with their diapers! They even labeled each diaper brand on the paper towels. Teams were so into this diaper experiment. Every group, except one, found Huggies Overnights to hold the most water (of course!). We then began evaluating each team’s process and determining whether our results were valid. Finally, I exposed my secret about the overnight diaper. I immediately showed them a Bill Nye video on the importance variables and precise measurements in a science experiment. 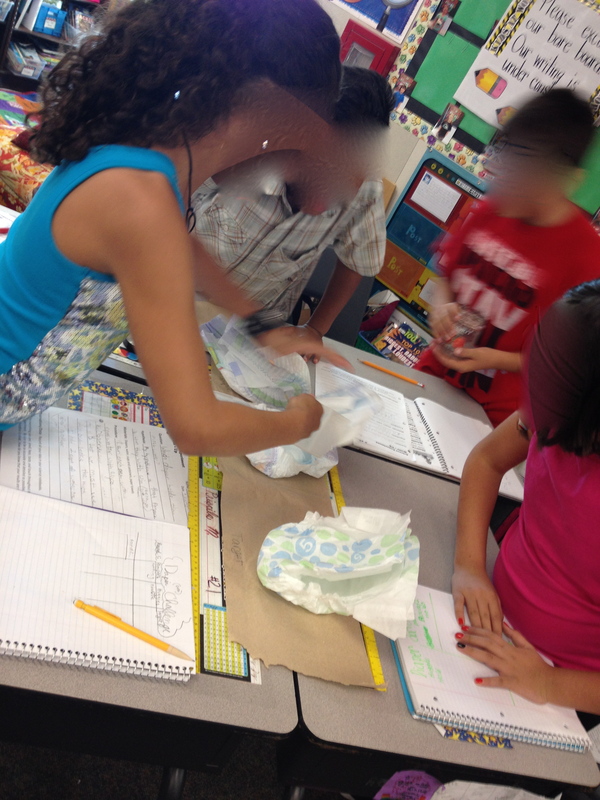 We also ended up cutting the diapers open to reveal how in the world the diapers held so much water. This is another reason why I love this experiment. It fosters so many more questions the students have that lead to more investigation. Inside the diapers is a crazy gel like substance that starts off looking like cotton, but when it comes into contact with liquid has a chemical reaction which changes the entire look and feel of their material. I finish up this lesson with a student journal reflection about what we would do differently if I let them do this again. Also, a homework assignment to research and find out what the material is inside of a diaper.